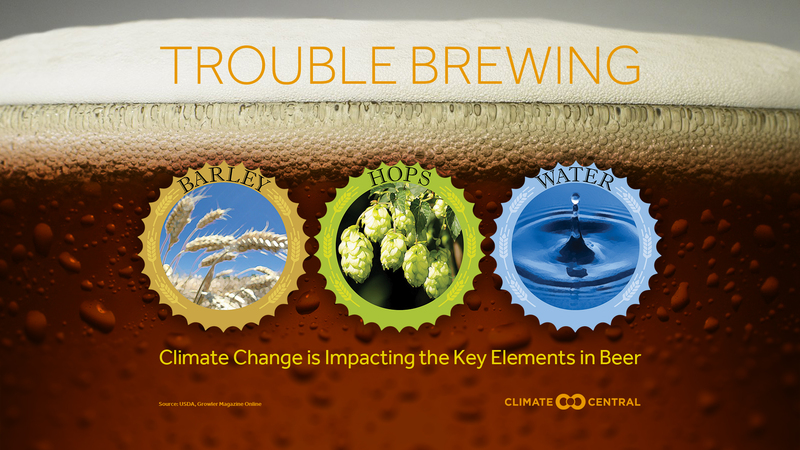 Climate change affects three of beer’s core ingredients: hops, water, and barley. Hops are affected by heat and drought, and with 99 percent of U.S. hops grown in the Washington, Oregon, and Idaho (with over 70 percent grown in Washington alone), the drier climate developing in the West will impact production. Water available for irrigating the hops largely comes from annual melting of winter snowpack from the mountains. A warming world means more rain versus snow in the winter, meaning irrigation may depend more on ground water, which has a higher mineral content and affects the beer’s taste. Barley, the most common grain used in fermentation, is primarily produced in the Upper Midwest and Northern Rockies, and like many cereal crops, it is particularly susceptible to heatwaves and droughts. U.S. farmers are planting less of it to reduce their financial risk. Last year, Montana farmers planted 23 percent less barley for the beer market than in 2016, meaning the final cost of beer at the pub or market may be going up. Beer is also big business. Increasingly, locally owned craft brewers are having an impact on the industry landscape and on the economies in which they are located. According to the Brewers Association for Small and Independent Craft Brewers, a craft brewer produces six million barrels of beer or less a year, with less than 25 percent of the brewery controlled by a larger organization. In 2016, sales of craft beer were up 10 percent, accounting for nearly a quarter of the total U.S. market. Local craft brewers contributed $67.8 billion to the U.S. economy in 2016, representing more than 456,000 jobs. Find out how much of an impact was made in your area by visiting their state-specific statistics page. 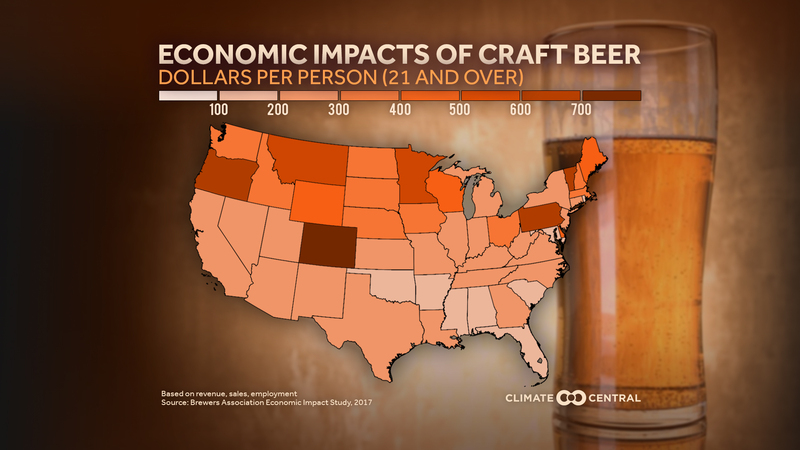 Methodology: Economic statistics provided by the Brewers Association for Small and Independent Craft Brewers. Statistics for 2017 will be released by the end of March. Their full economic impact methodology can be found here.